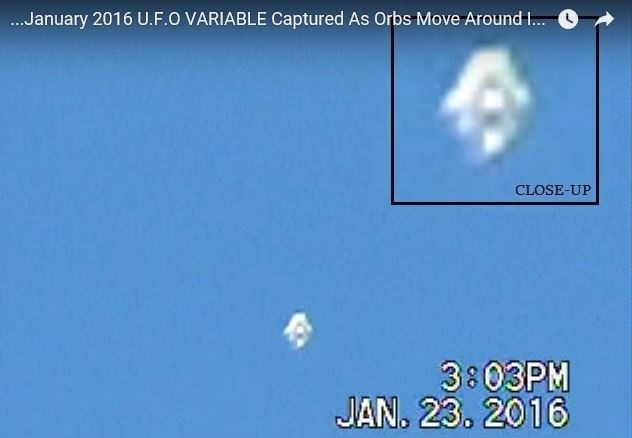 The UFO researcher Mario Vallejo (SAUFOTX) filmed the mysterious UFO “variable” traveling at a high altitude over San Antonio, Texas, on January 23, 2016. According to Vallejo, he was sky watching, looking westward, when he noticed a white cloud-like object visible high in the cloudless sky. The mysterious object was traveling at a very high altitude and at a constant speed. Vallejo could tell from the motion that the UFO was flying under intelligent control. As he filmed the mysterious UFO and watched its morphing behavior, he became convinced he was witnessing a rare demonstration of a form of advanced alien propulsion technology, based on conversion of solar energy into EMP. According to Vallejo, he has researched this form of alien technology for years. “As I began to film and zoom in you can see it rotating changing its shape [morphing],” the UFO researcher writes. “It was clearly traveling at a high altitude at constant speed in a controlled manner.” He continued, “I tried my best to keep it in frame as it traveled overhead… you can see it traveling at a constant [velocity].” Vallejo was convinced that the UFO was an example of a form of alien UFO called a “UFO variable,” based on advanced propulsion technology. The apparently excited UFO researcher, who tells us that he has investigated UFO variables for years, expresses excitement at the opportunity to film a demonstration of the alleged alien technology over San Antonio, Texas. “I have researched this subject and come to realize this is a real phenomenon,” he assures viewers. “In my opinion I believe to have captured one traveling overhead.” “Clearly travelling at high altitude… clearly no aircraft, weather balloon, satellite or space debris.” According to Vallejo, UFO “variables” are based on a form of propulsion technology that is able to harness the power of solar radiation to generate electromagnetic propulsion force, or EMP. UFO variables are an example of alien technology based on physical laws of propulsion and inter-dimensional travel unknown to humans. The alleged technology is so advanced that it makes the technologically advanced “grey aliens look stupid.” He draws viewers’ attention to “orbs moving around inside” the UFO, and suggests they are the heart of the UFO’s engine that helps it to convert solar energy into “electromagneticity.” “For those unfamiliar with this phenomenon UFO variable, it is believed that these crafts are converting the sun’s energy into electromagneticity to travel around,” the UFO investigator explains. “If you pay close attention you will notice these UFOs have spheres that rotate inside them.” The video has attracted considerable interest in the online UFO community, with many enthusiasts professing interest in alien propulsion technology, contributing suggestions to clarify the UFO phenomenon unveiled in Vallejo’s “rare” footage.